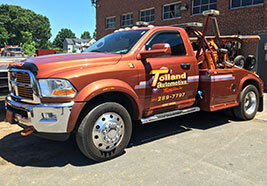 Tolland Automotive is a professionally operated full service towing, recovery and road service company serving the Hartford CT area, and beyond. Our GPS tracked state of the art fleet of light & heavy-duty wreckers, flatbed trailers, tractors, service trucks, watercraft, air cushion recovery and support vehicles are expertly maintained and ready to respond with highly trained personnel, 24 hours a day. Our fleet of whether you need a jump start, or are stuck on the road, our light-duty tow trucks are ready to respond anywhere in the Hartford CT area at a moment's notice, 24/7. Our skilled professionals will get you safely off the road and bring you back to our shop, or we'll bring you and your vehicle to the destination of your choosing. Is your truck stuck? 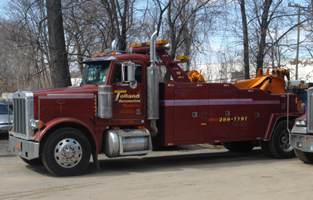 Our fleet of heavy-duty tow trucks, recovery, and support vehicles can get you moving again. Proudly serving the Hartford CT area, our skilled professionals have the knowledge and the skill to handle any job from a simple tow to a disaster recovery.